This is an awesome Lakeview Tan Tar A Estates offering 3 Bedrooms and a Lakeview Hot Tub on the outside open air deck. This house screams Margaritaville with its décor and the screened in Lakeview Patio. The Master Suite offers a King-Sized Bed and the other 2 bedrooms offer Two Queen Beds, a small refrigerator, microwave and coffee maker in each room. Each Bedroom also offers a private bathroom, open air decks and there is a half bath located in the main living area. 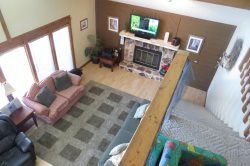 This house offers plenty of room to spread out with two levels, two open air decks, a screened in porch, a wood burning fireplace and a sofa sleeper in the Livingroom making it comfortable to sleep up to 12 people in beds. Each bedroom has its own cable TV with free WiFi throughout the house and a large Flat Screen TV in the Livingroom. Tan Tar A Estates offers two outdoor Swimming Pools which you can enjoy and The 9 hole Hidden Lakes Golf Course is available for an additional fee. Tan Tar A Estates adjoins Tan Tar A Resort, home of the New Margaritaville and The Oaks Golf Course. Most of the resort amenities can be enjoyed except for the outdoor point swimming pool and the indoor fitness club. As you can see this house has something for everyone with plenty of space to spread out. So, pack your bags, grab the gang and head on down to enjoy everything lake of the Ozarks has to offer. In the off season, Labor Day – Memorial Day you can enjoy just the top level of the house which includes the Hot Tub, Livingroom, Kitchen and Master Suite for $159.00 per night and add additional bedrooms for $99.00 per night.